Two of the most important things a manufacturing engineer needs: flexibility and speed. 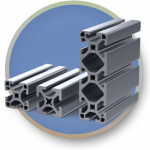 With T-Slot Aluminum, you get that and more. No need to weld, no need to clamp, and no need to cut and finish. Additionally, it's corrosion resistance makes it sought after by almost every industry and costs less than welding/finishing steel. 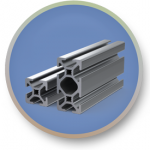 Get whatever you need built fast and strong with our inch-series profile of extruded aluminum.